After a long awaited sleep, we awoke again bright and early for a full day of excursions. After breakfast we waited for our 8am pick up for the Golden Circle and Fontana Spa Tour. Unfortunately it turned out that our booking agent had given us the wrong pick up time, and we were actually being picked up at 10am. Despite being a bit annoyed that we could have had an extra few hours in bed, we took advantage of the complimentary breakfast coffee and hung around in the bar area for a few more hours. After we were finally picked up, we were excited to head out and see Iceland’s National Park, and enjoy a few hours of relaxation at the spa. The first stop off was at Thingvellir where we saw the largest natural lake in Iceland before heading to see the continental drift between the North American and Eurasian plates. 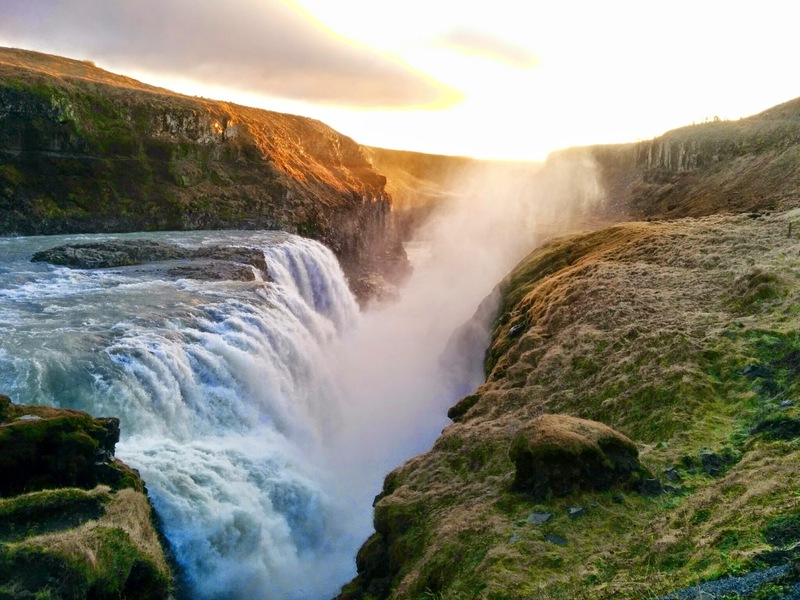 We headed down to walk across the gorge from America to Europe, and had a quick look at the waterfall Oxarfoss before heading back to the coach. The next stop was the Fontana Spa, where we were left by our coach for 2 hours, before another coach would be along to pick us up and take us on the rest of the tour. After arriving at Fontana I can honestly say that I am glad we chose to spend time here instead of the Blue Lagoon. While the Blue Lagoon is much larger, from what I heard it is also quite busy, being the most popular attraction in Iceland. Fontana, although very small, was wonderfully peaceful, with only 7 of us having the place to ourselves, it never felt crowded at all. On entering the changing rooms I was glad that I had previously read up on etiquette in Icelandic baths, as I think the naked Icelandic women wandering around, combined with the lack of private changing rooms, left some of my fellow tourists a bit shocked. Thankfully I was prepared, having been informed that in Icelandic baths it is requested that you strip down and shower naked before putting on your swimming costume and entering the pools. They even pop up a sign showing you where to concentrate the most when washing. The Spa consisted of 4 pools of varying temperature, and you could also swim in the lake, but I found this far too cold, and after making it in as far as ankle height I ran back out again. The natural pool was our favourite, being one of the warmest, and having no chlorine or chemicals in the water, we relaxed for some time in this pool. After just over an hour in the pools we headed back to get showered and spent the last 30 minutes in the cafe sharing a lovely tomato soup before the coach picked us up again. We were even given a sample of warm geothermal baked rye bread with butter which was lovely! After the coach came by to pick us up we headed next to the Gulfoss Waterfall, the largest waterfall in Europe. The views are spectacular, we weren’t expecting anything anywhere near this grand in scale. We also visited the cafe to sample Iceland’s famous meat soup! Basically a watery lamb stew, but very nice non the less, and an excellent way to warm up on a cold winter day. Finally we headed to Geyser, dormant since 1916, this is the geysir all are named after. Although dormant, it’s neighboring geysir Strukkur erupts regularly every 5 to 10 minutes. While here we witnessed a few eruptions, two small, and one much bigger. After a long journey back to Reykjavik, we went straight back to the bus depot to grab a quick tea and jump back on the coach for the northern lights tour. As this was our last night in Iceland, we really hoped that this would be the night they appeared. The journey our to our first viewing point was tiring, it had been a long day but we were determined not to leave without seeing the lights. we first headed out to a church on the coast, but even though the sky had a glimmer of faint green across it, there was not much activity and it was hard for the naked eye to see anything, so after about 30 minutes, we moved on. Next we headed to Garskagi, and sat out on the rocks overlooking the coast with the lighthouse behind us. Again we culd see faint green streaks across the sky, but there didn’t appear to be much movement, although the colour was definitely more visible here. After a while the magic happened, it was as if the strips of green slowly became stronger, before dropping a curtain of green across the sky. The lights waved like a snake across the midnight sky, with stars brightly shining behind them, and every so often a shimmer of light would move across the ribbons of lights, with glimpses of oranges, reds and purples dancing in front of us. We must have sat out there watching the lights for almost an hour before they faded away, and we headed back to the hotel, tired, but thankful that we had been given the opportunity to see this majestic sight first hand.